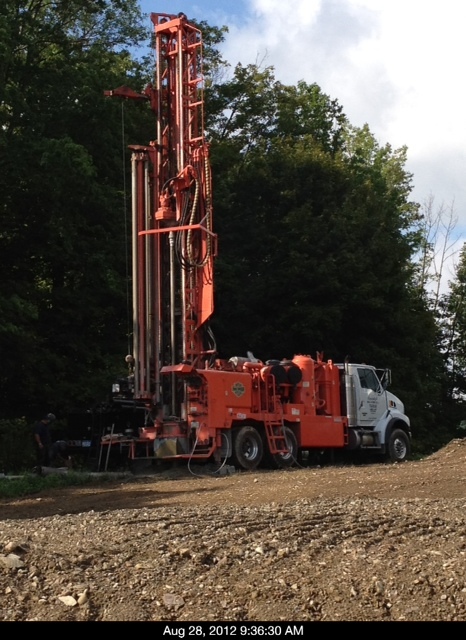 The 5-acre lot we’re building on is located in Newfield, NY, south of Ithaca. Newfield is a sparsely-populated area with picturesque rolling farmlands with a history built on the determination and resourcefulness of Czech and Finnish immigrants and descendants. Our lot, on the eastern slope of the sprawling Benjamin Hill, is one of several subdivided from a former farm. The lot is mostly field bordered on the south side with woods. Before a house is built up, you need to dig down. Our general contractor, Matt Ness, has been busy orchestrating the preparations for foundation and house placement. The excavation for the basement and frost walls for garage and entryway are now complete and awaiting the arrival of the precast concrete walls. The excavators found the soil to be very easily-worked clay/sand mixture with only small rocks. This is in contrast to 2 neighbors who have built nearby in the last few years on ground that is riddled with hardpan and shale rocks making excavation more difficult and landscaping a chore. Our general contractor, Matt Ness, pitches in by jumping into the trench to provide surveying guidance for Jim Proctor’s artistry with an excavator. About the same time the excavation was completed, Randolph Well & Pump Co., Inc. came in and dug our well using quite a huge rig that made the 240-foot well an easy day’s work. It didn’t hurt that the shale they ran through was lower-density high-carbon shale that was easy for the drill bit to work through. Photo courtesy of Matt Ness. One page buried in our title abstract causes us continuing grief. People of Pennsylvania and New York are very familiar with “fracking” (hydrofracking), a well-drilling technique used to extract natural gas from vast shale reserves by fracturing the shale deep in the earth. Very big money is involved and the topic has pitted neighbor against neighbor in heated discussions about economic impacts, royalty windfalls, property rights, environmental issues, and social upheavals. I won’t rehash any of the arguments here, but I do want to show how the topic of gas leasing affected us personally and maybe, in the process, serve as a warning to anyone owning, buying, or selling property. Surprising (and expensive) issues related to gas leases can bite you. A few years ago we started searching Tompkins County in New York State for a few acres of land to build our retirement home. We looked over several possibilities and rejected a few outright because they had existing gas leases on them–we were familiar enough with the issues that we didn’t want somebody else’s decision affect any use or restrictions on land we would own. 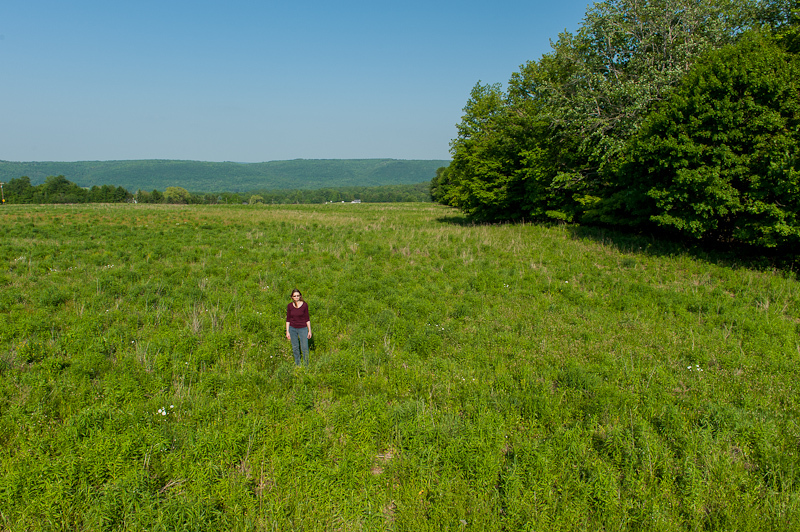 We settled on a nice 5-acre lot in Newfield, south of Ithaca. We bought it from the previous owner (a lawyer) who assured us that, although there once was a gas lease on the property, it had expired. We informed our lawyer of our aversion to gas or mineral leases and that the deal was contingent upon the land being free and clear. The previous owner signed an affidavit certifying that there was no current lease on the property. We closed the deal and were happy and excited new landowners. A few months later we got some bad news. We found out, through a nearby lot owner who was equally surprised in her case, that our property did indeed have an active gas lease on it. The original gas lease, signed by the owner of the farmland that was eventually divided into 5- and 10-acre lots was renewed by the lease-holding gas company (Chesapeake Energy) who notified the then owner of the properties, a development company, who then apparently neglected to inform all the lot owners who had purchased from them. So, a few dozen parcels of land were now owned by people who were almost all unaware that their properties were encumbered by active gas leases. So what. We found, through our neighbor’s plight, that most or all local banks will not issue mortgages or home equity loans on a property encumbered with a gas lease that includes surface rights for the leaseholder. (By default, almost all gas leases written and signed at the time specified expansive rights on and below the property surface.) One banking official told us the reason for the reticence was that, in the event of a gas company polluting a property or leaving piles of abandoned equipment could induce loan defaults leaving the bank holding the bag on a bad loan and a multimillion dollar cleanup. So now we owned property for which a bank would not loan us money to build a house or, later, give us a home equity loan. This is not good. Plus we saw our property’s value plummet before our eyes with this revelation. We decided to try to get the leaseholder to release us from the gas lease. We secured the efforts of an attorney who attempted to convince the leaseholder to nullify the gas lease on our property. They have no incentive to do this and, unsurprisingly, declined. Our lawyer kept patiently and persistently working with her contacts and eventually got the leaseholder to relinquish the surface rights secured in the gas lease on our property. We were joyful. This removed the impediment that banks have with loans on lease-encumbered properties. The remaining terms of the lease were still in place but were not of the grave concern that surface rights were (to us and the banks). We searched public records for names and addresses of the other lot owners and sent them letters explaining the gas lease and banking implications as well as the importance of removing surface rights. Several have since thanked us and pursued surface rights release for their own properties. We also spoke with a malpractice firm who said we had very good grounds for a suit but the economics of such a suit worked against us: the maximum damages awarded to us under NYS law if we won would not be adequate to entice a malpractice attorney to take the case on contingency, meaning it would cost us even if we won. With gas lease surface rights removed, we decided to now focus on building our new home on our property. Our planning indicated that although we could finance a big chunk of it, we would need to finance part of the construction. No problem. We paraded our sterling credit ratings and sound financial footings past an admiring loan officer. We mentioned that we even secured the surface rights from the gas lease on the property. You could hear the tires skidding. The ability to borrow at all depended on the surface rights status but even having a gas lease at all was a bad thing. Banks still consider it a higher risk. Once again, the gas lease was going to cost us: an extra 1/2 point up front and 1/8 percent extra on the mortgage rate. This is not huge money but it’s not trivial and it’s on top of all the other time and money we spent on the gas lease situation. Gas leases on properties are bad according to lending institutions. They may either deny lending if surface rights are included in a lease (as they usually are), or make the cost of borrowing higher because of the “risk” of a gas lease. If you are buying property in the shale gas region, it is best to buy only land that is free and clear of existing gas leases; whatever your opinion of shale gas drilling, you surrender a lot of flexibility (and probably value) if there’s an existing gas lease on the property. Choose your lawyer carefully when buying property. 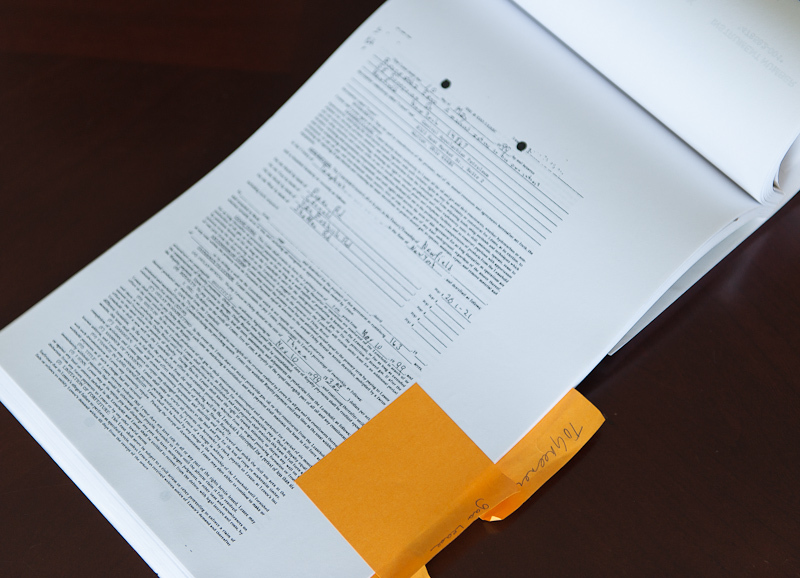 Make doubly sure, in writing, about your requirements relating to gas leases on a property. Try to choose a lawyer who has experience with, and knowledge of, the implications of gas leases on property ownership. One helpful hint: if the attorney’s law firm also handles work for local banks, they will most certainly be sensitive to gas lease issues. If you are thinking of signing a gas lease on your property, thoroughly investigate the implications of what this might mean for you, for your ability to borrow, for the future saleability of your property. By the way, if you have a mortgage and sign a gas lease, you may be in violation of the terms of your mortgage and could be subject to immediate demand for full payment of the balance. Almost all gas leases signed before the whole uproar over hydrofracking were signed with no attorney review, and even if they were reviewed, attorneys at that time likely had little knowledge of the implications of these very poorly written leases. Everything about these leases was vague and heavily skewed toward the leaseholder. Many of us are suffering the consequences of these leases today as hydrofracking has rolled over the area with all its implications. ≈ Comments Off on We’re Building a Home! Two years ago we bought a 5-acre lot with the intention of building our retirement home on it. 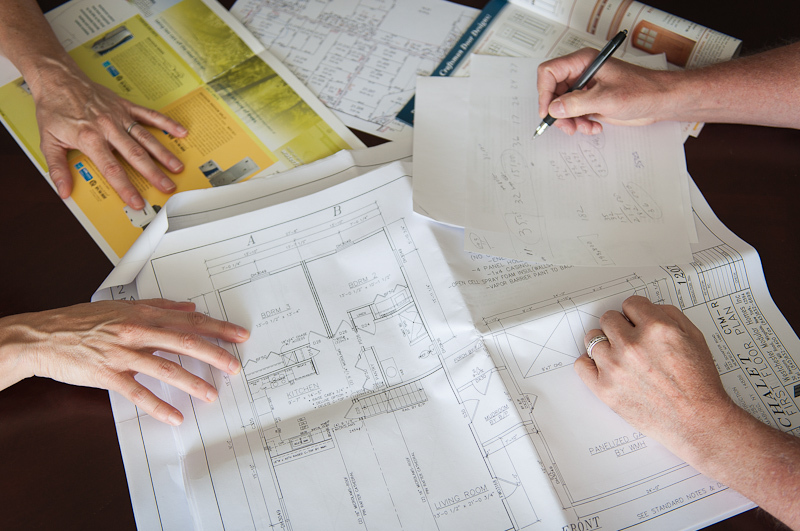 Selecting a builder, developing a house plan, sorting through construction options, selecting heating and cooling, settling on flooring and cabinets and siding and endless other details–it’s been a pile of work and we’ve only recently broken ground. We ended up selecting a local builder with 30 years experience and a superb reputation, particularly with new friends and future neighbors who built on neighboring properties. We decided to go with geothermal heating and cooling. We also decided to go with modular construction, primarily due to the opportunity for better quality control, leading-edge construction techniques, and faster construction times. We also have already run into unpleasant surprises having to do with gas leases, financing, and their relationship. There will be some future posts devoted to these topics in detail, along with some warnings for anyone thinking of pursuing a similar path. I’ll try to post pictures of the progress as we go along as well. Things are, almost suddenly, moving along very quickly now. This is my second foray into blogging. The first, a photography blog (phlog?) ran out of gas after a year or so. This time around I’ll stick to what I do best: randomly stagger from one unrelated topic to another. Photography will still figure prominently at times. But I’ll also be posting material on software topics (primarily WordPress coding and administration), home building adventures, and anything else that pokes into my consciousness. Nobody will find this blog uniformly interesting but there will be bits and pieces, here and there, that may be useful to certain people at certain times. So although this blog will be a subset of my brain’s attic, it has the benefit of an overlaying organizational structure (categories, keywords, search engines) that makes it far more efficient and accessible than cocktail party conversation.